Hi everyone, It is Harshi again. I forgot to say one thing yesterday, I am 12 years old, and study in 8th grade which is 7th grade in the USA. I want to tell you how much importance we Indians give to fresh, home cooked food. Mumbai is one of the biggest cities in North India. People need to travel two to three hours to go to their schools or offices. But they've found a way to get their home cooked food. 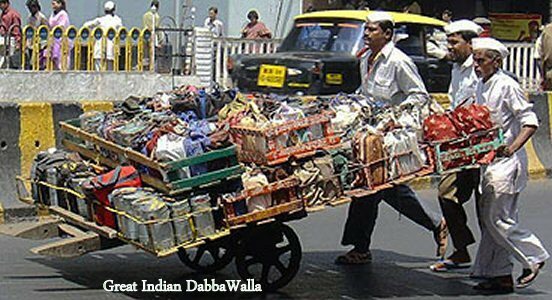 The Dabbawalas. Clad in complete white, 5000 men take up the job of delivering lunch boxes to offices and schools across the city. 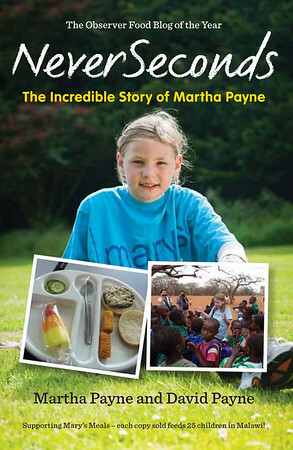 It is amazing that they deliver about 200,000 lunch boxes a day! The Forbes magazine has given them a 99.999% in accuracy of delivery! The top business schools are analysing their supply system. Prince Charles wished to meet these people and was thrilled to know about their work. 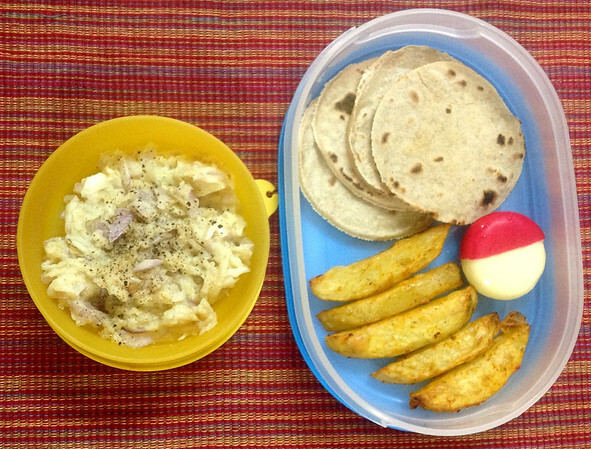 Here I've attached a link to let you know about the mind blowing lunch box delivery system of Mumbai. Today I had home packed lunch. It is wheat Chappathi or you can call it a Roti. After Rice it is the main alternative food. It Tastes a bit like Tortillas. Apple and Onion salad with yoghurt and little pepper to spice it up. It was good. The Potatoes are oven baked. It was a fusion of different tastes, with Italian and Indian herbs. Yummy. I had it with Baby bell Dutch cheese (from Holland). It was wonderful. 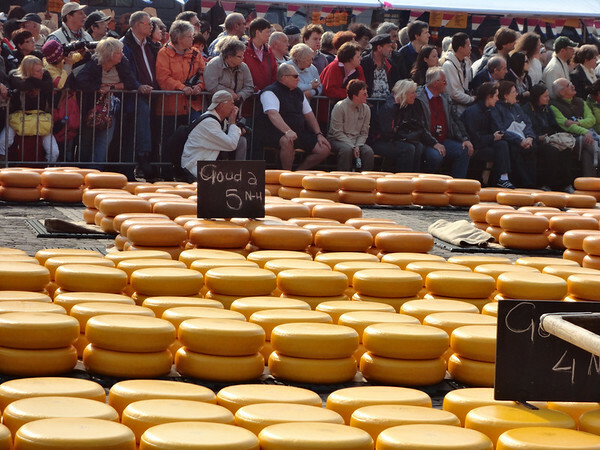 For me the love for cheese started from Alkmaar in Holland. The cheese paradise of the world. I love Chappathis. My friend used to have spicy ones in his packed lunch and we would trade things for them! Yum. red wax, they take one half and put it on their nose, like a clown. They roll it with their fingers into balls, try to form shapes...and the adults cleaning the table always are careful to pick up all the little pieces scattered on the table and the floor (wax on the bottom of the shoe is not fun to remove). Here's a map and a list of all the different varieties: http://www.lesfromagesdefrance.fr/ believe it or not there's not enough space on the map to locate all of them. And this map only represent the traditional varieties! There are also all the industrial cheese you can buy at the supermarket. It is a major food, ask anyone what their favorite cheese is and they will give you 5 different names and brands. The taste of cheese is directly linked to where the cows, sheep and goats live and what they eat. If they live in the mountains, they eat local grass and plants, their cheese taste like the mountain. If they live in pastures, they eat green grass, the cheese taste "green" and fresh. If they live in water meadows by the coastline, the taste of the cheese is influenced by the ocean. If they live in a farm and are fed with straw and cereal feed, the cheese has less flavor. If they live in the South by the Mediterrean Sea, they eat the local plants, their cheese is flavored like your potatoes with the aromatic herbs. The cheesemakers wrap the cheese with the local plants too: wrapped in wood from the mountain forest, or wrapped in a woven mat made from bulrush growing in the water meadows. French cheese are fresh like soft curd or very old and hard like wood. They are sweet or spicy. They are salty or moldy (the mold is edible and tasty). They will melt in your mouth or they will burn it for hours. They can be one week old or two years old. They can have no smell or be so smelly they will make your eyes water. They are yellow, blue/green, red, white, orange. They taste lighter in summer and stronger in winter. Some cheese are only produced certain months of the year, if you miss it, you have to wait til the next year (while the animals feed their babies). Not eating cheese or yogurt in France is very uncommon. If you have cow milk allergy, you are in trouble!